Lake Tahoe is a jewel. The community around Lake Tahoe is so concerned about zebra mussels they have recently enacted strict measures to assure Lake Tahoe remains a jewel. According to a September 26, 2008 press release from the Tahoe Regional Planning Commission, new boat rules will take effect on November 1st (Tahoe does not get ice in the winter). These rules “… require boats be launched at facilities where qualified aquatic invasive species inspectors are present …” and also require “… that vessels launching at the lake be decontaminated …”. The goal is to “inspect every boat that enters the lakes of the Tahoe Basin.” The Commission is discussing fees at the boat ramps to pay for this program. When a community believes a resource like Lake Tahoe is a jewel, they will take actions, even draconian actions, to protect that resource. There are no comparable requirements for Lake Minnetonka even though zebra mussels (and several other damaging aquatic invasive species or AIS) are threatening. I believe Lake Minnetonka is a jewel for our community, indeed for the entire state. Why have we not taken the necessary actions to assure its protection? It is time we take the threat of zebra mussels and other aquatic invasive species that threaten our lake seriously. I have spent the past couple months visiting with mayors, city councils and other elected representatives around the lake to discuss the institutional framework for providing appropriate protection from zebra mussel and other AIS. All agree that AIS, both in the lake and coming to the lake, ought to be taken seriously because they do or will cause damage. However, when it comes to the question of who should implement or pay for protection and control programs, the conversations break down. Make no mistake – adequate and appropriate protection and control measures will require changes in attitudes and culture and will be costly. However, inaction or apathy are also costly and are not a rational game plan. The Lake Minnetonka Association has proposed and recommended comprehensive inspections around the lake and in tributary lakes. 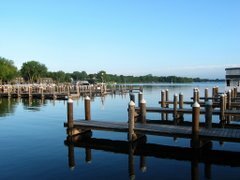 We have recommended closing some accesses at some times to facilitate inspections and we have proposed assessing fees as a fair and appropriate way to fund protection activities specific to Lake Minnetonka. To get traction on real protection actions, we must have leadership and new thinking as well as a willingness to coordinate these activities. All agencies are rightfully aware of and concerned about being fiscally responsible, especially in this weak economy. However, substantially all of the funding for the actions we are recommending could actually come from user fees. We know that user fees and access inspections will be unpopular, but we believe these are fair and proportionate with respect to the nature of the threat. If we rely on existing funding sources and authorities, we will fall short. The state of Minnesota collects a boat license surcharge ($5 for a three year license). This plus some money from the general fund gives the DNR AIS program $3.9 million per year. Of that, only $100,000 (less than 3%) comes back to local communities for AIS prevention grants across the state. Similarly, the Lake Minnetonka Conservation District directs a portion of its funding to AIS programs, the harvesting program and the inspection program, which represent about $110,000 and $45,000 per year (respectively) and they receive money from the DNR (for harvesting) and from their private Save-the-Lake Fund (for inspections) to offset these costs. Some have suggested the constitutional amendment that would dedicate 3/8 percent of sales tax toward environmental and arts programs offers a new source of funding for AIS. However, the language authorizing the amendment would not provide for AIS-related, rather of other water programs. AIS prevention programs to adequately protect Lake Minnetonka will cost much more than is now available. Both the DNR and LMCD funds are effectively capped unless significant changes in statute or funding occur outside their respective internal controls. Again, we think that user fees are an appropriate source of new funding. Lake Minnetonka is a jewel and our leaders’ actions should demonstrate that by supporting creative and appropriate protections and getting together to address this large problem.